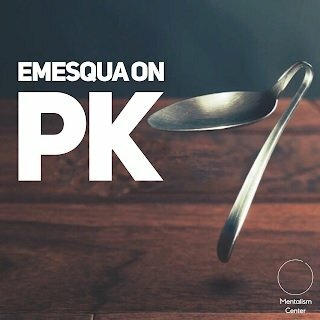 The underground Carlos Emesqua offers now in this new work a fantastic set of ideas for your repertoire the power of using PK also known as Psychokinesis. Realistic moments of mystery using natural objects, offering supernatural events. New approaches for bending, techniques, routines and more. 1. REAL PKMB: For the first time, you will learn the real secrets in doing metal bending as real psychic and not a pseudo-mentalist. 2. Emesqua Signed Coin Bend: This is how Carlos performs a signed coin bend. No secret benders. No sleight of hand needed. No fake coins. Just pure psychic energy (apparently). 3. Pendulum Twist: A dramatic, memorable moment using a pendulum and spoon. 4. Supernatural Key: Emesqua approach for the classic Haunted Key. 5. Free Bend: Two coins are clearly shown, then one of them is bent in the participant's hand. No switches. 6. Which Bend? : A beautiful and simple casual routine involving a psychic interaction and a coin bend. 1st edition 2018, 23 pages.